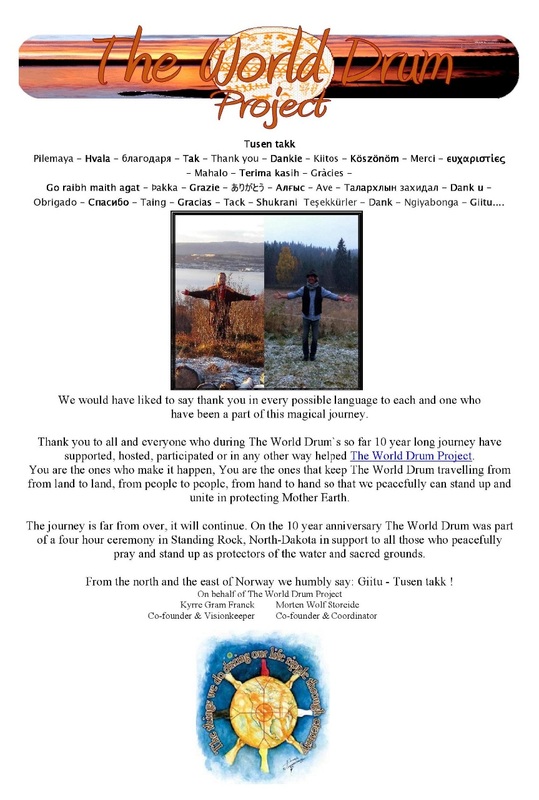 The World Drum celebrated Her 10 year anniversary in Standing Rock. Read the story below. The World Drum is just now on way back to Standing Rock, North Dakota to be present together with the protectors of the water and sacred land. Grateful towards Jesse Lopez who host and bring TWD back to where it is strongly needed with prayers and peace. After the 10 year anniversary in Standing Rock, TWD went to the Missouri River with Cathy Johnson and then later to the congregation at Universal Unitarion Fellowship in Topeka with Linda Daniels. Since TWD have Her own will, She find Her way on new paths. The future schedule are due to change. Just now TWD is on the way back to Standing Rock to be present with the protectors of the water and sacred grounds. We are grateful towards Jesse Lopez who host and bring TWD back to this historic and important happening, where TWD may share Her prayers and peace. The story of the World Drum Project’s 10th Anniversary starts in September. I have had the honor of hosting the World Drum many times over the past 10 years of its journey. I originally learned about the World Drum Project in the summer of 2006 from an article I read about it in the Manataka American Indian Council newsletter, Smoke Signal. The article told how to go about getting on the list to receive the Drum. Then a member of the local Kansas City percussion group, Women of the Drum, I contacted group founder Regina Compernolle to see if she had interest in the project and we agreed that Women of the Drum would host events in Kansas City. Since that time, I had worked with the World Drum Project multiple times, including the Moment, which occurred on the Project’s 6th anniversary in 2012, and February 14, 2016, when the Drum was included in the Kansas City World Sound Healing Day event. 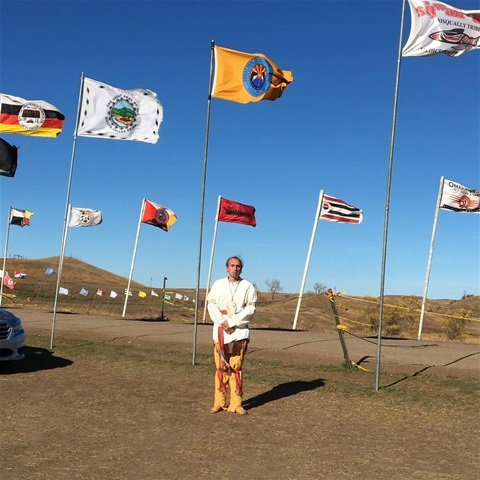 I had messaged Morten Storeide on Face Book suggesting that the World Drum needed to go to the Standing Rock Dakota Access Pipeline camps up in North Dakota. Members of our Chickamauga Cherokee group had been up to the camps and we had participated in local demonstrations in Kansas City as well. Morten responded that John Two Hawks and Jesse Lopez were heading up to the camp on the 15th and that the World Drum was on its way to Jesse; he was concerned that the Drum might not make it in time for their departure. So I agreed to take it up if it did not arrive in time to go with them. We anticipated a delay of a day or two. That day passed, and the next. John and Jesse were returning on the 20th, so by Monday we had figured out that I would not be able to get it up there before they returned home. Another week passed. The World Drum has had travel diversions before, so we were not initially overly concerned. As time passed, however, and neither DSL or USPS could locate the Drum, we began to be concerned. The Drum was scheduled to be in Chile for the 10th Anniversary. Morten could not locate the contacts in Chile, nor could he locate the Drum. Eventually it became apparent that the Drum would not make it in time to ship it to Chile. Again I volunteered to assure that an appropriate anniversary celebration would be planned in the Kansas City area where the Drum has acquired a significant awareness and following over the years. Still, we could not locate the Drum. I was pondering what to do, as press releases would have to be developed, a venue for a ceremony acquired etc. But how to do this when I was not sure when the Drum would arrive. Finally, the Drum was tracked to US Customs in Chicago and we expected delivery within a few days. But still no Drum. USPS said the Drum was still in Customs; Customs said the Drum was in the USPS system. I was pondering what to do, as press releases would have to be developed, a venue for a ceremony acquired etc. But how to do this when I was not sure when the Drum would arrive. 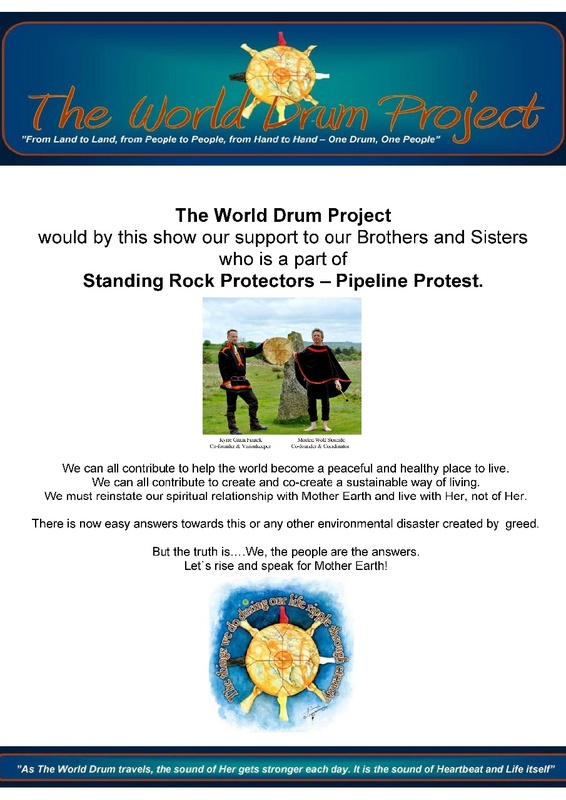 Then the idea hit me: the World Drum should be at Standing Rock for the 10th Anniversary of the World Drum Project. I contacted Jesse and Morten; everyone was in agreement. Morten said that he had been wishing for that since he had figured out that the Drum would not be in Chile. There was a chance Jesse might be going up on the 20th and I agreed that, if not, I would take the Drum up. I told Morten, now that we have figured out where the Drum wants to be, it will show up in the next three days. And it did! Jesse’s trip was delayed. I planned the trip with a few of our Chickamauga Cherokee, Peter Francis, who had been up in August and Jan Owens, who leads our monthly Fellowship in Rayville, MO. Peter is a delightful young man; a warrior with a sweet spirit who has been raised with traditional Cherokee ways by his parents, Robert and Janet Francis. I had asked Peter to carry the Drum for this trip; I felt strongly that he was to be Drum Keeper, energetically, at Standing Rock. It was no small thing for him to leave home at this time as he was assisting Robert to prepare for ceremony at our home grounds in Butler on the 29th. His absence would be a sacrifice for Robert and Janet as well. Jan Owens is a beautiful woman, both spiritually and physically. Jan is a vocalist and had been told that she would be receiving a song for the journey, which she did. I was getting ready for work on my home to start while I was gone, so Jan did most of the trip planning. We decided we would all meet at Jan’s and head up together in one vehicle. I picked the World Drum up from Dr. Jesse Lopez’s office in Overland Park. Jesse, an amazing man with a huge heart, is a surgeon and has created a cooperative to assist with medical supplies and assistance for the camps. Then the Drum and I traveled to Rayville where we would spend the night and set out early the next morning. Peter arrived late that evening. We had a new member of our travel group, Jeff Chaves, who we were to pick up at the Kansas City airport the next morning. Jeff was flying in from South Carolina to go back to the camps, which is where he met Peter in August. His plane arrived around midnight, but he thought he could just stay at the airport until we left early in the morning. However, Peter received a call from Jeff at 3:00 am; the airport had closed and he was out in the cold. So Peter picked him up and brought him back before we left that morning. Jeff proved to be an interesting part of our journey. Planning to winter over at Standing Rock, Jeff was trying to find a teepee cover and liner that he could purchase and pick up on the way. He was also in need of a winter coat, which necessitated several stops to locate. Jeff is a big boy – 3X required and not that easy to find. But Jeff kept us laughing the entire trip, with his spontaneous humor and many stories. Jeff was excited to get to the ‘front line’ at Standing Rock. He was a warrior ready for whatever came his way. And he would be in the Morton County jail by Saturday morning, one of 127 people arrested during direct action prayer service on the 22nd. We loaded up early in the morning and headed out around 7 am. After a long journey that included several stops to look for Jeff’s coat (which we finally found in a Tractor Supply store in Aberdeen SD), we finally reached the Standing Rock reservation at 10:30 that night. Since we did not think we could locate a camp site and set up in the dark and cold, we spent the night at the Prairie Knights Casino on the reservation about 10 minutes from the camps. We had arrived after dark and did not have a view of our surroundings. From the parking lot at Prairie Knights, you can see for miles, the hills, valleys and buttes of North Dakota. I had to pause in the cold morning air and breathe it all in. This is Indian Country. You can feel it in your bones. And it is a beauty feeling. And defend all that we can. To protect our Sacred Land. And we’ll save our Sacred Land. We would share the Drum and the Song multiple times during our short stay. The Big Camp is, well, big. It is hard to tell how many people are there. This is the more transient camp where people come and go, swelling on weekends and holidays and diminishing during the week. We only had time to visit this camp and Sacred Stone camp; we did not get to see Red Warrior Camp or Rosebud Camp, although Rosebud was just across the river and some people joined the Water Ceremony from their side. The site of the Big Camp is sacred. There are buttes nearby where vision quests occur and the original Sun Dance site is included in the perimeters of the camp. Everything about the land here has an almost visceral quality of the numinous. Peter had decided that the best place for the Drum’s energy on the 10th anniversary would be the Water Ceremony that morning, playing the Drum as the sun rose over the river. Since we could not take photos during ceremony, we approached the media tent where assignments were being made for coverage of the Water Protectors efforts. The World Drum was assigned to Sarah LaFleur and Jonathan Klett. Sarah and Jonathan were very respectful and interested in the World Drum Project and grateful that it had journeyed to Standing Rock for the 10th Anniversary. They filmed us talking about the World Drum and playing and singing Jan’s song both at the River and at the Sacred Fire circle for the camp. Many people were present at the Fire Circle and appreciated the efforts of the World Drum to be there. Sarah would also be arrested Saturday morning and placed in the Morton County jail; we have not yet heard from Jonathan. Media, anyone with a camera are being targeted by the Morton Country Sheriff’s department. They are sending a very clear message of intimidation to any media that trying to document what is going on up there. The next morning we took the World Drum back to the Sacred Fire for ceremony on the day of the 10th Anniversary of the World Drum Project. Ceremony started at 6 am. After going to the sacred fire, prayers were said to support the purpose, the ‘why’ of the camps, of the activities: to protect the Waters as the Life Blood of Mother Earth. The then women initiated the Water Ceremony. Prayers were said. Water was blessed and taken to everyone in the circle. We each received a small portion of water in our left hand which we sipped and then touched to our body for healing anywhere we felt we needed the touch of sacred, healing water. After everyone had received the water, we began a procession to the river, singing water songs and playing the Drum. As we walked through the camp, late risers joined us. Each received water, as we had, and joined the procession to the river. The atmosphere was relaxed but the sense of the sacred permeated the songs, the walking, the waiting as new comers received water and joined us. When we arrived at the river bank the Warriors were asked to line the pathway down to the river, which was a little steep and somewhat muddy and slick. The men lined up on each side of the path, in which small foot holds had been created. It was still very dark at this time. Then the women started down the pathway to the water, using the hands of our protecting warriors as a support. I touched the hand of almost every man in both lines as I descended to the water. Each of us, women and men alike were provided with tobacco in which to place our prayers; our prayers for ourselves, our families, our communities, our Land and Water. As we approached the water we offered the tobacco and some of the blessed water to the river. After each of the women present went to the water, ‘Two Spirits’ who identified as women were invited to come to water. After these, the men, the Warriors, as well as the ‘Two Spirits’ who identified as Warriors. Lastly, those who identified as both were invited. One young man who identified as both female and male in spirit expressed deep gratitude for the recognition of the fluidity of gender and shared a beautiful buffalo song while Jan played the World Drum. Throughout the Water Ceremony, water songs were shared and the World Drum was played. Additionally, the refrain “Water is Life”, “Mini Waconi” was called out in many different languages and chanted by everyone in that language. A gentleman who had been at the fire circle the evening before announced that the Drum had been around the world 10 times. Many hands played the Drum that morning as the sun rose over Standing Rock, reflected in the water. These camps are amazing places. There is a kitchen at each camp and everyone is fed from these kitchens. We are buffalo with vegetables and gravy one lunch. The buffalo had been butchered the day before 5 feet from where we sat and had been processed on the table where we were eating. Peter had brought meat from two lambs that had been butchered just days before we left as well as ground goat meat. Food donations continue to arrive and no one goes hungry. Everyone is interested in each other’s stories. Everyone is grateful for the support being given to the camps. There is a communal spirit that is seldom seen elsewhere. People are united with a common goal; people are united for survival. Everywhere there is activity, a lot of which is targeting settling in for the winter. Construction was heavy at Sacred Stone camp. They were having a weekend long event where everyone was assisting in the construction of more permanent winter shelters; to reward the efforts, there were concerts going on late into the night every night. Johnny Depp had been there only two days before our arrival. Since he is one of my heroes, I was sorry to have missed him. But so many prominent stars have visited, standing in solidarity for the work that is going on there. It is a humbling thing to see the dedication and determination which the Water Protectors are acting. It was an honor to honor them with the presence of the World Drum. Since returning we have been looking for opportunities to share the World Drum and our experiences at Standing Rock. My Monday night drum class had an opportunity to pray and chant with the Drum. Yesterday, Wednesday, October 26, the Drum went to a Mid American Indian Fellowship meeting. Sunday I am taking the Drum to services at the Universal Unitarian Fellowship here in Topeka, then handing it off to Jesse Lopez who is returning to Standing Rock on Monday, October 31st. Eventually the Drum will get to Chile! But for now, the World Drum Project is standing in solidarity with Standing Rock. 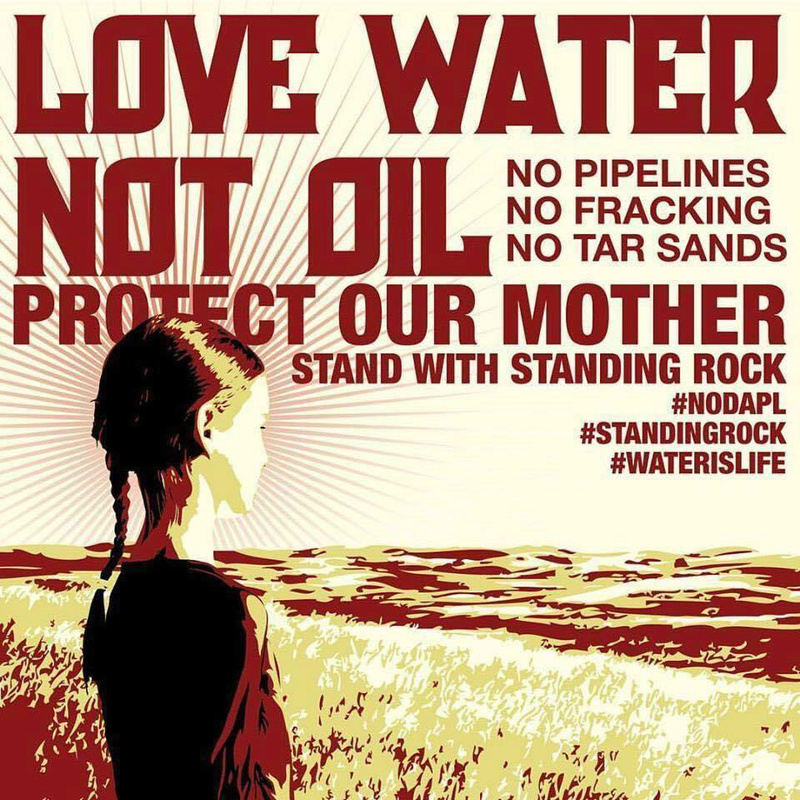 Water is Life and a right for everyone, so we honor the water and everyone that protects it with John Two-Hawks song "Sacred Water"
Because The World Drum found Her own path and went to Standing Rock and now latest have been by the Missouri River and the congregation at Universal Unitarion Fellowship in Topeka, the future schedule are due to change. Just now TWD is on the way back to Standing Rock. "As The World Drum travels She gets stronger each day. It is the sound of Heartbeat and Life itself"